his secrets and magical advice just to you. 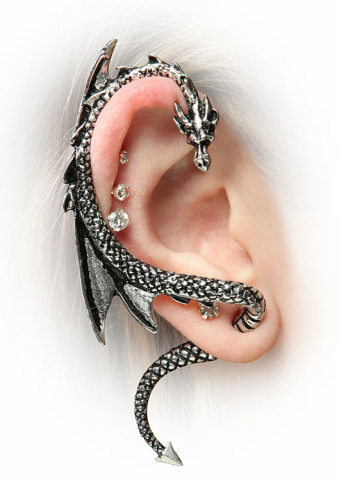 This devilishly clever dragon requires one standard ear piercing to anchor the tail in place. According to customer comments the upper portion of the wrap can be gently bent to adjust the size to fit your ear. If you have cartilage piercings you may have to make some adjustments to their backings to fit this wrap around your ear. But this is worth it so that he can look like he's guarding your favorite valuables. 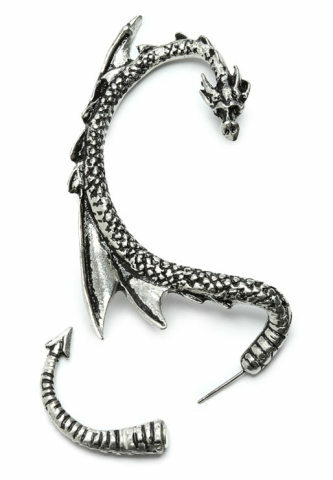 The dragon is made of English pewter and does not contain any zinc, so it is safe for people with zinc allergies. The post is surgical steel. You can select between your wrap being for the right or left ear. To order your Dragon Ear Wrap, click here.